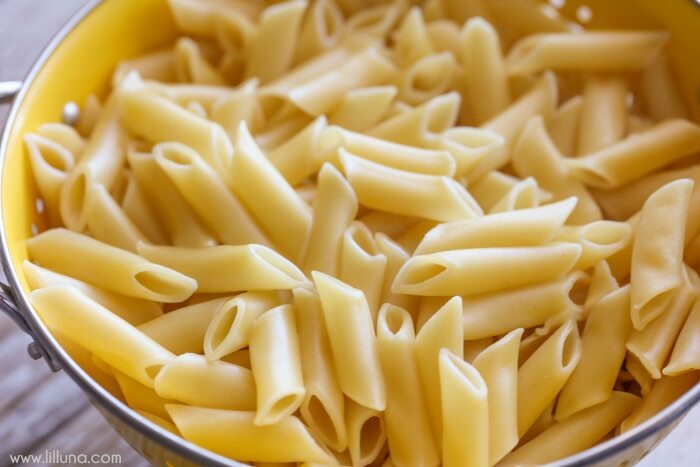 There are two reasons we make pasta so often. The first reason is they’re usually SUPER EASY!! It’s usually a matter of boiling pasta and making some yummy sauce to mix it with. The second reason is ALL my kids love Pasta!! With five kids, it’s not always super easy to find a dish that everyone loves so you better believe I’m going to keep making pasta each week. 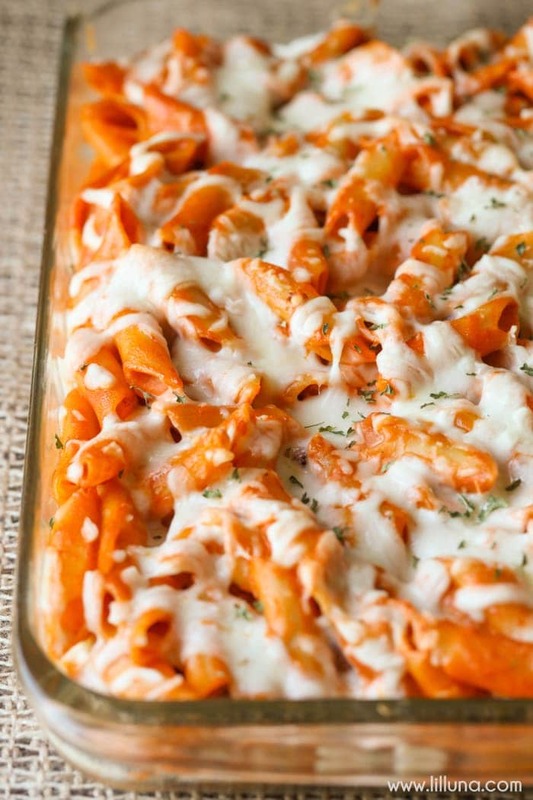 Today’s recipe is for a Cheesy Ziti Bake. 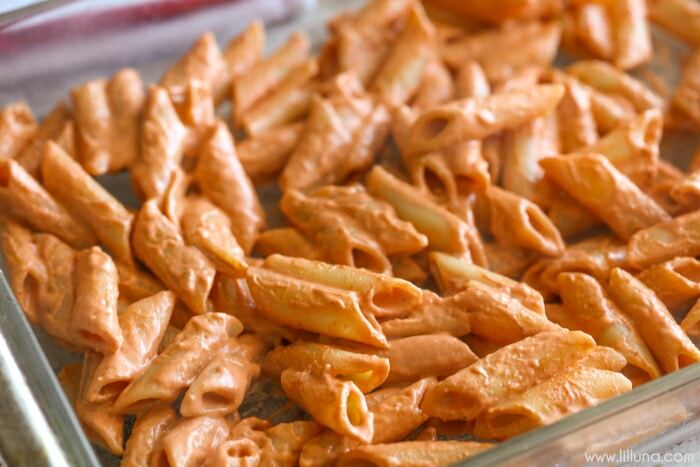 The sauce is so flavorful and creamy (it has cream cheese) so you better believe it’s super yummy!! 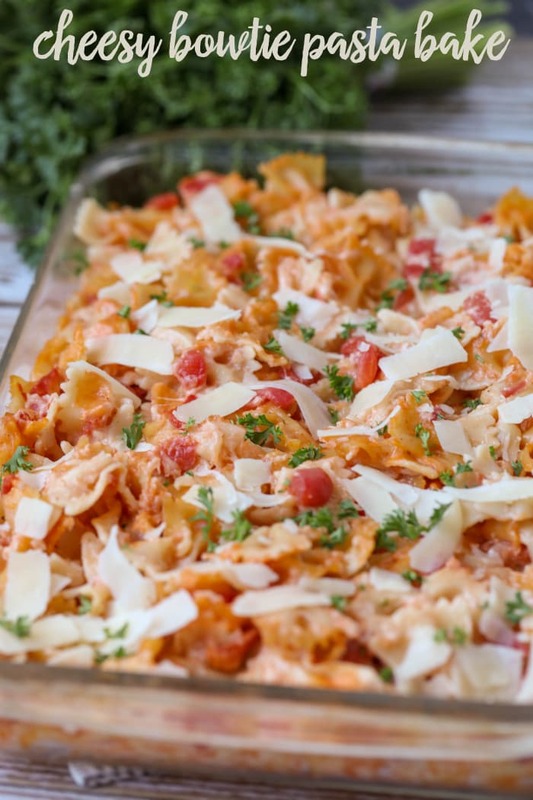 It’s also topped with a delicious layer of cheese which is the best way to top off any recipe!! Serve with your favorite homemade rolls and veggies and you have a great dinner meal. 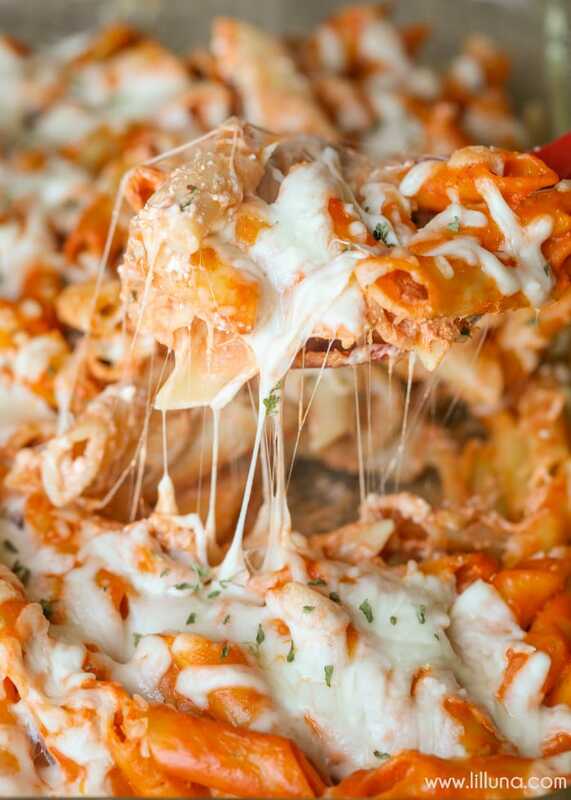 Cheesy Ziti Bake - a simple and delicious dinner recipe filled with a cream cheese and tomato sauce topped with cheese! YUM! 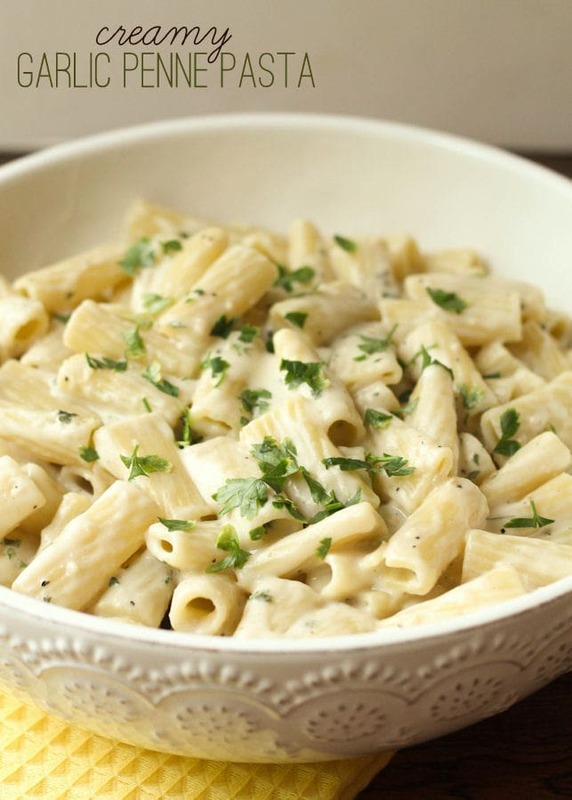 Cook pasta as directed on package in a large pot. Remove pasta. Add pasta sauce, tomatoes and cream cheese to large pot and cook until well blended and cream cheese is melted. Add pasta back to pan and mix well. Layer half the pasta into a greased 9x13 pan. 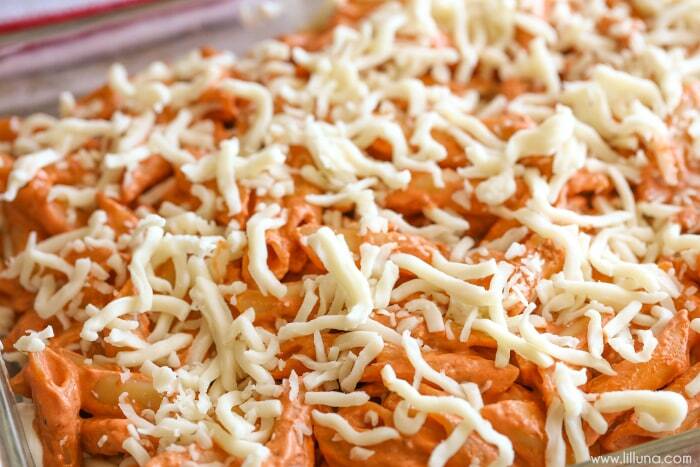 Top with sour cream, 1 cup Mozzarella cheese. Layer on the last of the pasta. 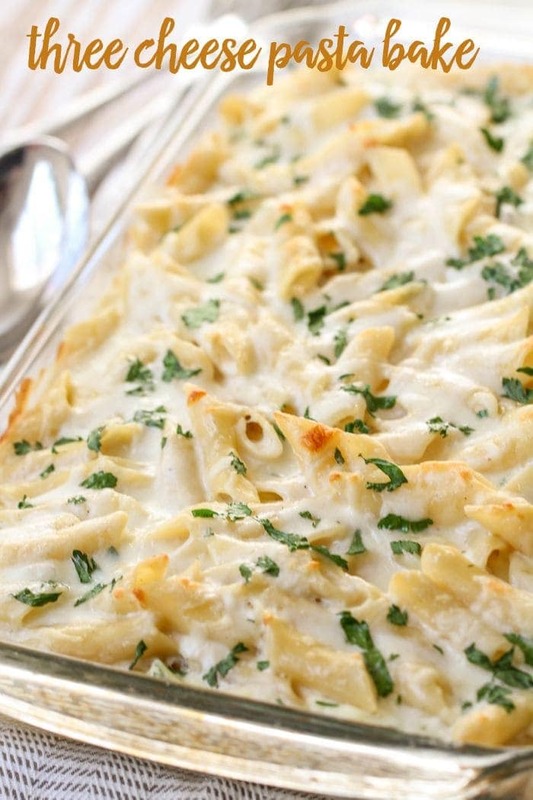 Top with ½ cup Mozzarella cheese, grated Parmesan cheese and parsley. 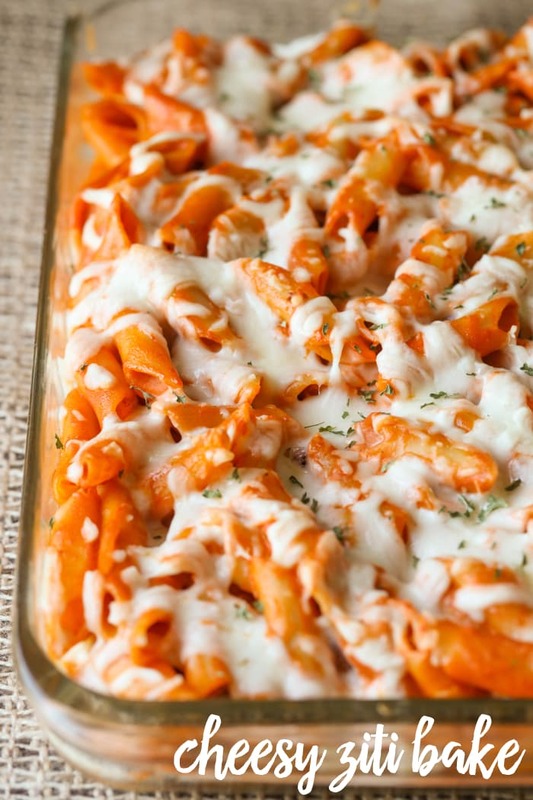 This Cheesy Ziti Bake is so simple and delicious!! I think next time I’ll try and sneak in some zucchini too. I think that would be a great addition. Don’t you? Thank you – it really is so good! 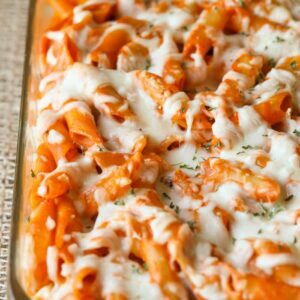 If I were to use ground beef in this recipe would I add the tomato sauce, tomatoes, and cream cheese to it (after browning ofcourse) then mix in the pasta? That’s what I would do 🙂 I bet it would be good in there!! I would be making them ahead of time,now do you think they would freeze ok or even make them a day before and refrigerate?? We have a four day family reunion with about 30ish hungry people. I am always looking for fun,easy and affortable menu options. Keep your awesome recipes coming. How fun!! I’m glad you found some recipes to try! Yes, these should freeze just fine. Have fun with your family! Could you do a recipe section of your tried and true recipes? Most recipes are sponsored by, for example “Ragu”. Not hating because everyone has to make a living, but just want to know which recipes are actually YOUR recipes that you like and use all the time. Not recipes you are forced to throw together in the name of sponsorship. Yes, it is 🙂 I hope you will give it a try & that your family likes it!